The Indian armed forces have been successfully working on an armaments programme using various modifications of the BrahMos missile, which was initially conceived as a Russian-Indian project. Russia’s NPO Mashinostroeniya and India’s Defence Research and Development Organisation established the joint venture BrahMos Aerospace Private Limited in 1998. The new anti-ship cruise missile was modelled after the Soviet Union’s Oniks system (called Yakhont for export markets) and is distinguished by its outstanding technical features. The joint efforts of Russian and Indian specialists have resulted in the emergence of a new series of cruise missiles that are superior to any of their global analogues. There are different versions of the missile capable of striking both ship-based and land-based targets. They can be launched from aircraft (Su-30MKI), ships, submarines and land. Several different variations of the missile have been created for the army and categorised into different blocks. The BrahMos Block I land-attack missile, which is capable of striking visible radio-contrast targets, has been fully developed and is used by the Indian army. Block II was set up to strike at less visible targets and features both target-seeking equipment and satellite navigation. 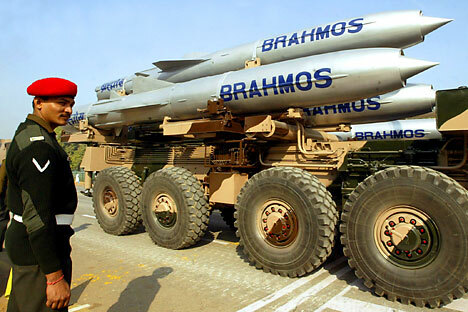 The Indian army is now expected to place orders for a shipment of the Block III supersonic missiles, which are capable of striking targets in mountainous terrain with a high level of accuracy, according to BrahMos Aerospace CEO Sivathanu Pillai. The new missile combines the best features of the first two blocks. Dr. Pillai said the two technologies were used to create a product with the configuration of an anti-ship missile that can also strike targets on land. It has a radar seeker that can strike all radio-contrast targets, infrastructure, buildings, radio detection equipment, radar stations and air force bases – any object that reflects the appropriate signal. One of the main features of the new missile is its ability to scale mountainous terrains, find the target and strike. There are no other supersonic cruise missiles with such features in the world. The Russian and Indian scientists managed to accomplish an extremely complicated task. “It was almost impossible to do: to ensure manoeuvring and the nosedive when the missile is travelling at supersonic speed. Nobody has ever made anything of this kind. Nobody has even tried to do it. We managed to do it, and quite successfully at that,” Dr. Pillai said proudly. Dr. Pillai said the ramjet system is fully operational and ensures the missile travels at a speed of approximately Mach 2.8. Block III is considered the world’s first supersonic missile capable of travelling in the mountains. When Russian and Indian scientists work together, they are capable of working wonders, the BrahMos Aerospace CEO said, and it is a hard point to argue. The BrahMos Aerospace press service told Rossiyskaya Gazeta that the new missile system is fully prepared for production and that the company is currently determining the configuration of a missile facility for the army and the number of launching pads that will be needed. In addition, Dr. Pillai said the joint venture has developed a version of the BrahMos that can be launched from underwater. A test launch is planned for this year. “Our submarine-launched missile has already been developed,” he said. The plan is to launch the missile from a special pontoon on a stand just beneath the water. “We think we will make the launch this year and wrap up this work,” Dr. Pillai said.